India was in contact with the Roman Empire from the Republican day. There was significant trade between Rome and India from the first century BC. India was the source of perfumes, spices and gems which found a welcome market in Rome. In turn, international trade also saw Rome’s linen, glass and wine make their way to Asia. Significant quantities of Roman gold and silver coins have been found in South India alongside many examples of local imitations. Yes, the Roman coins from at least Augustus (27BC-14AD) were imitated in India and that practice continued in the 5th/6th century AD with Byzantine coins. The Indian Imitations demonstrate a very important point. These are not attempts at counterfeiting. Counterfeits are typically bronze coins gold plated. Here, Indian Imitations are just that. They are of similar quality gold as well as weight. This demonstrates that Rome was the Financial Capital of the World and as such, its coinage was worth MORE than the metal content. 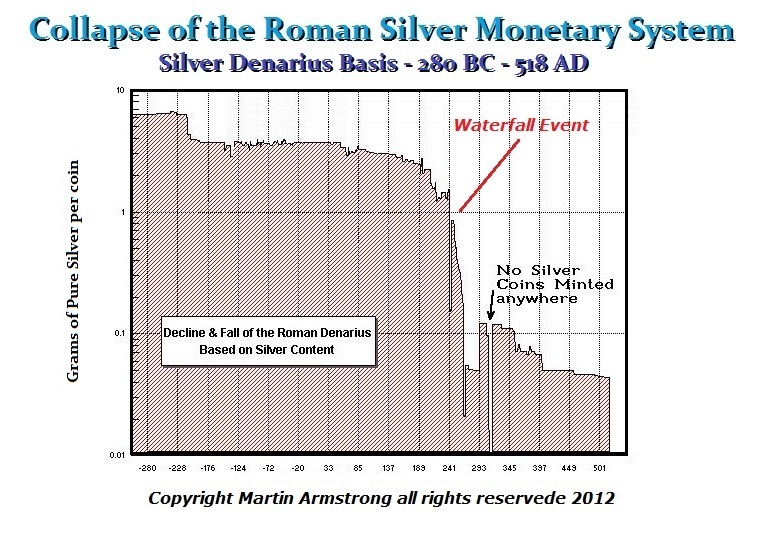 This is why it made sense to take raw gold and create imitations of Roman coins which traded at a premium. Probably the most commonly found imitations of Roman gold appear during the reign of Septimus Severus. From this period onward, there appear to be several mints creating imitations of Roman coins in India. Note the portrait of Septimus Severus is rather crude showing that there is a lack of talent artistically and the reverse appears to be an Indian soldier rather than Roman. What is also self-evident is that the prototypes were not always gold coins. Here is an Indian Imitation of a very rare Emperor Pupienus who ruled for only about 3 months. There is only one known gold aureus that has survived and certainly no double aureus or “bino” that has survived. The known coinage is usually restricted to silver and bronze. Here, the Indian artist copied a silver Anontinianus which was a double denarius distinguished by the radiated grown. The resulting imitation is simply not of a known coin. Here we have an imitation crudely copied of Gordian III (238-244AD). It is a bit underweight coming in at 3.05 grams compared to 4.58 grams. The lettering is also a bit crude as well. We do see that as Roman began to plummet into its economic decline during the 3rd century AD and barbarian invasions were becoming more common, naturally, the demand for spices from India declined significantly. From the early third century onwards, direct Indo-Roman trade declined, and communications with India passed into the hands of intermediaries. Indian Imitations appear to end with this period of Gordian III. We begin to see them once again around the time of Constantine I (305-337AD) and they will still appear with imitations of Byzantine coins during the 4th century AD. What we do know is that the various mints imitating Roman coins were in the Southern parts of India outside the Kushan Empire, which was north and stretched around Tibet to join India. 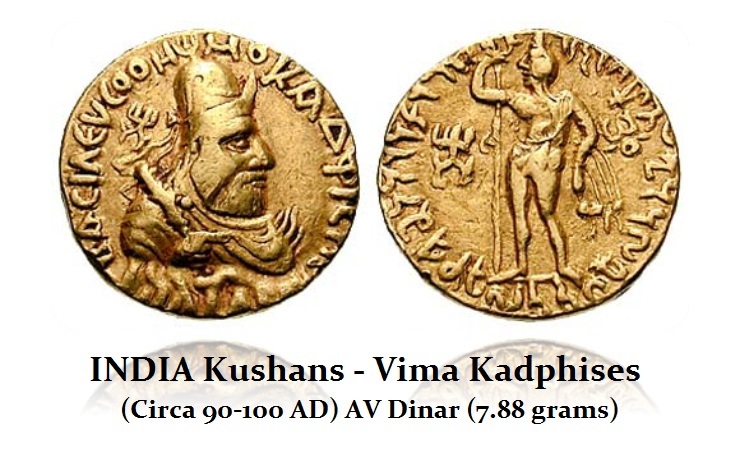 The Kushan Emperor Vima Kadaphises (c 90-100AD) is said to be responsible for introducing gold coins to India. Vima was the predecessor of Kanishka the Great, the fifth Kushan King, who ruled virtually all of northern India. Therefore, trade was clearly with the South and that is where the Roman coinage circulated. In northern India, from about 100AD onward, they introduced their own coinage for the first time in India that was not imitating Rome.